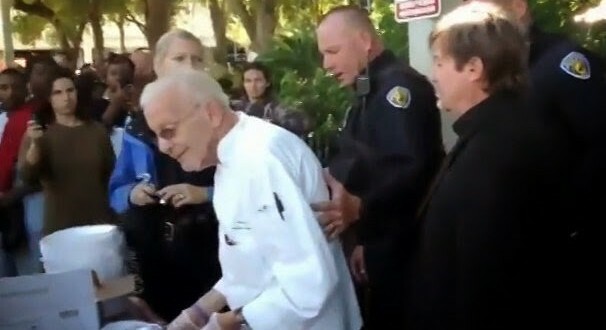 FORT LAUDERDALE: 90 Year-Old Defies New Law By Feeding Homeless In Park - Joe.My.God. Despite being charged with violating a new law by feeding the homeless in South Florida, 90-year-old Arnold Abbott said he’s not deterred and even went back out to serve more food at a public park. The faceoff in Fort Lauderdale over the ordinance restricting public feeding of the homeless has pitted those with compassionate aims against residents and businesses trying to protect their neighborhoods. Abbott, affectionately known as “Chef Arnold,” and two South Florida ministers were charged last weekend as they handed out food. They were accused of breaking the ordinance and each faces up to 60 days in jail and a $500 fine. “One of the police officers said, ‘Drop that plate right now,’ as if I were carrying a weapon,” Abbott said. But on Wednesday night, Abbott and others served a four-course meal by the beach as police filmed from a distance and a crowd of nearly 100 mostly homeless and volunteers cheered their arrival. “God bless you, Arnold!” some shouted. Others from the church carried signs in support of Abbott, saying the ordinance was violating their right to love thy neighbor. The Democratic mayor of Fort Lauderdale defends the arrests in the first clip below from CBN. The second clip shows the first round of arrests.